Perhaps like many dealers and consumers, the analysts who compiled the latest ADESA Canada Used Vehicle Price Index — powered by ALG — appear eager for spring to arrive, especially with the volume of new-vehicle sales in February. The February index increased after being adjusted for seasonality with wholesale prices ticking up on average by 0.2 percent month-over-month. Analysts indicated midsize SUVs showed the most drastic price decrease, sliding by 3.8 percent or $650. Next was midsize vehicles with a decline at 1.2 percent or $137. Minivans dipped 0.1 percent or $15. Conversely, compact SUVs showed the highest price increase at 5.9 percent or $854, followed by full-size pickups at 5.7 percent or $1,545 and mid-compact vehicles at 2.6 percent or $246. 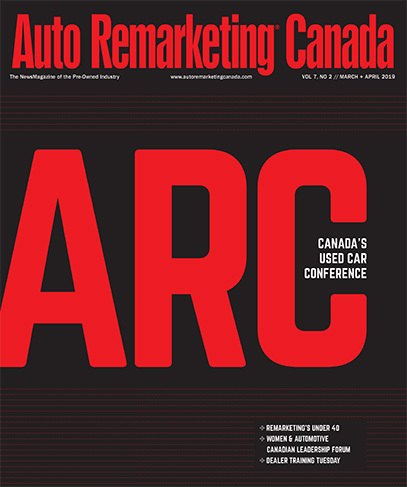 “With spring around the corner, Canada is moving towards the end of its comparatively slow winter sales season, bringing with it a 3.7-percent decline for February 2019,” ALG said in the latest update shared with Auto Remarketing Canada. “With a total of 120,891 units sold, last month fell just under 5,000 units behind last February, and this decrease carried less of a sting compared to the previous three months. Overall, February 2019 settled in as the third highest-selling February on record, just ahead of February 2016 and behind February 2017,” analysts continued. ALG reported that passenger cars have continued their descent, dropping 16.0 percent for the month. Meanwhile, analysts noticed the light truck market showed signs of life with a 1.2-percent sales increase. With this shift, ALG determined the light truck market accounted for 75.1 percent of total sales for the month. • Hyundai and Kia outperformed the market and generated sales increases at 14.6 percent and 10.5 percent, respectively, with Genesis claiming a 283.3-percent sales increase. • Lexus delivered a strong performance in February, claiming a 26.4 percent sales increase for the month aided by the introduction of its new Lexus UX. • The big three German luxury brands — Mercedes-Benz, BMW and Audi — all recorded double-digit decreases for the month, declining 21.9 percent, 15.5 percent and 27.6 percent respectively. • Volvo and Porsche also displayed strong single-digit sales increases for the month at 8.9 percent and 6.6 percent, respectively as both brands have entered 2019 strong. “Spring traditionally brings with it higher sales for the Canadian market with volumes typically peaking around May or June,” analysts said. “As of now however, first-quarter results for the new light vehicle sales market are expected to fall short anywhere from 3 percent to 5 percent compared against 2018.